Your garage door is what keeps your home safe. If you forget to shut it and leave it open, you’re inviting the world into your house. Chamberlain MyQ Hub looks to prevent this by alerting you when the garage door is left open for too long. Read on for more details about the Chamberlain MyQ Hub and Home Bridge review. Note that both the MyQ Smart Garage Hub and the Home Bridge require a 2.4 Ghz network to function. You will also want to make sure your garage motor is compatible by using their chart. Most brands of garage doors from after 1993 with standard safety sensors should work with Chamberlain MyQ, although there are exceptions. For example, Genie controllers after 2016 are not compatible. Besides these requirements, there are just a few basic steps of getting your garage door set up. The hub mounts to the ceiling near your motor. After you program it, the hub works just like a remote controller to open and close your garage door, communicating with your phone so that you can control the garage door within the app. Once it’s installed, open the app and go to Discovered Devices. We tried clicking on Add a Hub, but it was much more complicated and didn’t work for us. The included sensor installs at the top of your garage door. Its purpose is to let you know if the garage is currently opened or closed, based on its current position. To set it up, simply press a button and the sensor will automatically start connecting. 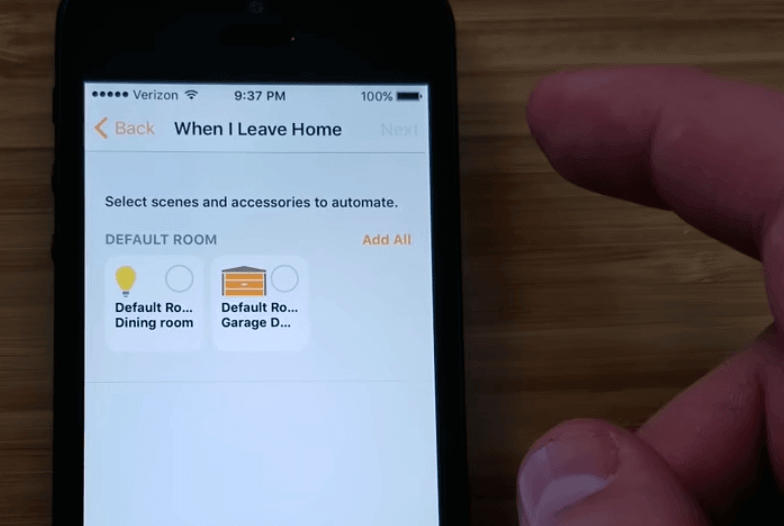 Home Bridge is another optional piece of hardware that connects your Smart Garage Hub, or other smart Chamberlain garage doors, to HomeKit. Similarly to the hub, you set it up by clicking Discovered Devices. After it’s set up, the bridge automatically transfers all of your settings and automation from the hub, and then you are able to use Siri to open and close your garage. All of the hardware feel decent-to-high quality, even though they are plastic. The hub and Home Bridge both come with a 1 year limited warranty. Besides communicating with your motor, the hub notifies you when someone closes the garage door using the app. It has a flashing light and loud beeps to notify people that the garage is closing soon. This warning delays the garage from actually closing for a few seconds as a safety feature. The safety sensors near the bottom of the garage door will still work normally and stop the door from closing if movement is spotted immediately under the door, but the beeping serves to warn those nearby before the garage door even starts moving. 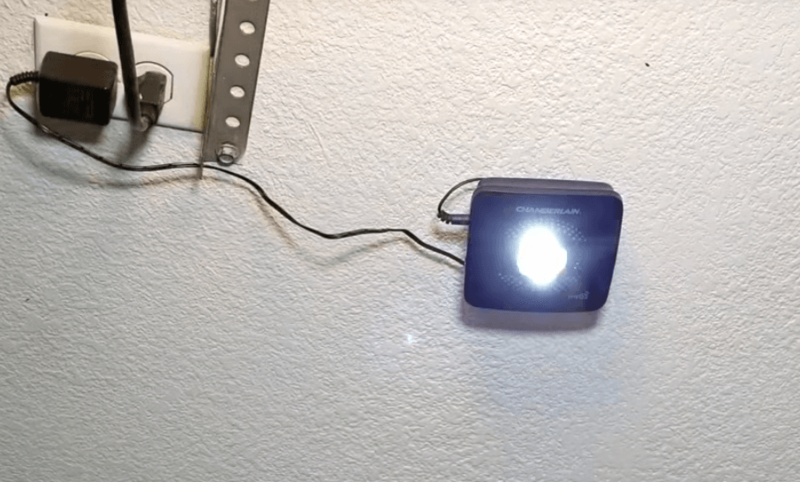 The small sensor installs to your garage door by peeling-and-sticking or screwing it in. The sensor comes with a CR2450 battery and the app will notify you when it’s getting low. Home Bridge can be mounted in the garage or placed in a room nearby. We plugged ours in on the kitchen counter and it communicated well with our hub. The bridge makes it possible to ask Siri if your garage door is open or closed and have her open it. The Bridge also works with other MyQ lights around your home. These accessory lights are designed to automatically turn on as you drive up to your home. You can also tell Siri to turn these lights on or off. Every time the garage door is in use, you can receive notifications. For example, if someone opens or closes it, you can set up push notifications alerting you of the change. From there, you can customize the alerts to be notified if the door is left open after a certain amount of time. You can also schedule the notifications so that you’re only alerted at certain times of day, such as at night. Both push and email notifications are available. Overall, the Chamberlain app is simple to use and has some basic functionality. Within the app, you can easily check the current status of your garage door to see if it’s opened or closed. From there, you can open or close it using one tap in the app’s controls. Another interesting feature available is the history of when the garage was opened or closed, making it easy to see when people have come and gone. IFTTT and Google Assistant are both available, but with a catch. It costs a monthly fee of $1/month or $10/annually. These are annoying charges that have created quite an uprising in the reviews on this device. However, the app has several notification settings and options on its own, so IFTTT is probably not typically necessary. In terms of other smart home compatibility, Chamberlain MyQ works with both Nest and the Wink Hub. It can be automated into your smart home system so that when the garage door is opened and indicates you are home, it notifies Nest and Wink to adjust the thermostat or other devices around the home. Unfortunately, there is no SmartThings compatibility at this time, which we would like to see them add soon. Home App lets you automate Chamberlain MyQ using geofencing so that the door opens when arrive home, and automatically closes when you’re leaving. 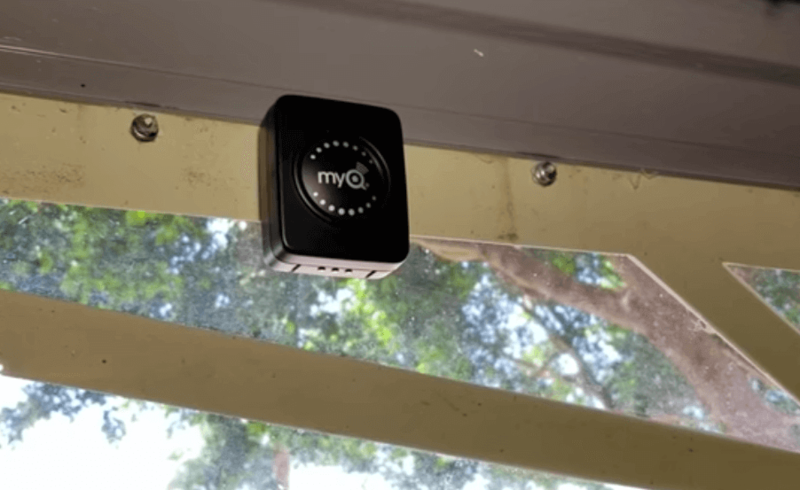 You can also use MyQ within the scenes of your Home App to automate your garage door with other smart home devices around your home. Overall, we are impressed with the Chamberlain MyQ Hub. While we had a few hiccups during set up, once we figured out how to set it up correctly it wasn’t too difficult. It’s nice that several automations and security features are included so that you won’t forget to shut the garage. Home Bridge works well if you’re a HomeKit user. It adds another layer of automation for closing and opening the door based on your location or home automation scenes. If you’re a Chamberlain MyQ user, what are your thoughts? How has the devices worked for you? Let us know in the comments below!